Beware of Google being misled – For the fainthearted . . . If Google says it is so, does that mean it is true? The dominant power on the world wide web has been invested with a sort of influence unknown to anyone in the past, even the medieval church would have spoken with only a fraction of the authority that Google commands. There is a tendency now not even to question the answers Google gives – if they are simple and non-controversial, then there seems no reason for them not to be authoritative. A cautionary experience came yesterday. With the ongoing closure programme, local branches of banks are becoming difficult to find. Lloyd’s Bank would once have had branches in Langport or Somerton, now a journey to Ilminster or Street has become necessary. Disinclined to drive into Street, where there is almost always a requirement to pay for parking, the thought occurred to Google Lloyd’s Bank branches. 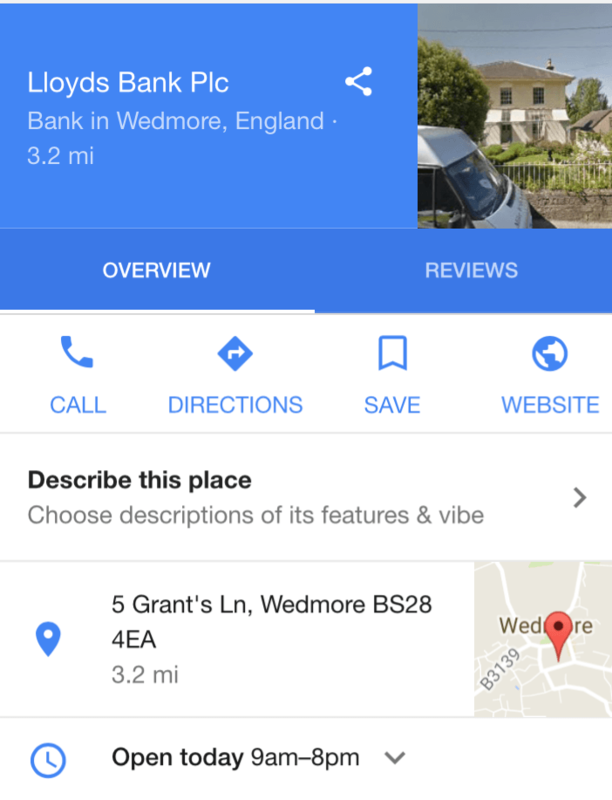 The search showed there was a branch in Wedmore. It gave a precise address and suggested the branch was open until 8 pm, a time that was a possibility for one evening a week in a rural community. Wedmore is an easy drive. Straight across Sedgemoor, then over the ridge of the Polden Hills before going through Shapwick and Westhay to reach the town famous for the treaty signed between the English and the Danes in 878. Wedmore is a very attractive place and a very vibrant place, with lots of interesting shops. 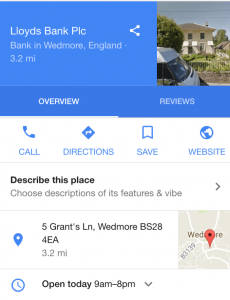 Having parked in the town, without needing to pay, and taken out my phone, the picture Google provided for the Lloyd’s Bank branch should have caused concern – it definitely did not look like a bank. Finding the street shown in the address meant finding myself among private houses, how did there come to be a bank listed at the address? Two local men said there had once been a bank in the town, but it had never been in the street where I stood. Google did offer the opportunity of feedback, I was able to click on a box saying, “This place doesn’t exist;” a while later a message came thanking me for my feedback. It was a baffling experience. 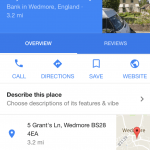 Google would only have used information provided by someone else, so who decided to list a bank at someone’s private address, including a postcode and opening hours in the entry? It wasn’t something that could have happened by mistake. Google is revolutionary, it is empowering, it gives access to the whole world, it is a resource undreamt of by most people, even a generation ago, but it can only be as authoritative as the information it finds. How many other people have trusted information that turned out to be entirely misleading? Not so long ago I was called to an ‘attend or lose your benefits for 12 weeks’ type interview at the local (ie about 9 miles away) Job Centre. Thought I had better jus check where the Job Centre was because not actually being unemployed…or ‘job seeking’ (I’m on Income Support because I care for my wife) I haven’t had cause to visit them in the last few years. You can take my word that the Job Centre isn’t in that 1950s council estate, nor even in the village but rather some 5 miles away (cunningly hidden -and I do mean hidden- in the local council offices). OK so my local knowledge was enough that I didn’t fall for google’s little tricks but what if I hadn’t have known darkest Northest Norfolk better than any sane person would want to? I would have driven to the fake job centre, missed the appointment and found myself on the wrong end of a benefits stop.